Food market of Ukraine has been an increasing demand for quails production which connected, first of all, with the taste characteristics of meat and eggs, if we will compared with chickens, ease of maintenance and feeding, the expiration date of quail eggs in comparison with chickens, the payback period and the amount of investment. One of the important elements of poultry production is compliance with the sanitary condition of the premises, incubator, products and the prevention of the formation of pathogenic and opportunistic microflora. Most disinfectants have high activity. But they have a short term of work, in some cases – carcinogenicity, high corrosion effects on equipment, hydrolysis and, in this connection, low communicative. Therefore, application of preparations based on nanosilver in the production conditions of poultry enterprises is a promising area of research. The purpose of our work was to conduct an analysis of the economic efficiency of used preparation nanosilver «Argenvit» during the incubation of quails eggs. For determine the effect of the preparation «Argenvit» on the results of the incubation of quails eggs, were formed four groups of eggs: control (non-treated eggs), first, second, third (eggs treated with the preparation) with concentration 0,1%, 0,2 %, 0,3%. The used of a colloidal solution of silver nanoparticles in demineralised water of the preparation «Argenvit» during the disinfection of quails eggs for incubation has a positively affects the outbreak of young quails, which is 61,7-66,1%, and it is higher than in the control group on 1,0-5,4%. The best result in terms of the outbreak of young quails was obtained in the first experimental group, whose disinfection of eggs was carried out in a 0,1% solution of the preparation was – 66,1%, which more than in the second and third experimental groups on 0,8-4,4%. The use of 0,02% solution of the preparation «Argenvit» during the incubation according to the scheme: aerosol treatment of eggs at the 1st and 15th days of incubation, has a positive effect on the results on incubation of the quails eggs and on the indicators of economic efficiency. The output of day-old quails is increased by 48 goals, which contributes to an increase in profits on 184,00 UAH and an increase in the profitability of the production of day-old quails on 12,64%. Keyword: quails, incubation, nanosilver, eggs, disinfection, profit. Economic efficiency of using preparation “Argenvit” in incubation of quails eggs. The implementation of the healthy nutrition concept of the population is one of the main places belongs to food safety. The main criterion for evaluating products in the world is the quality that determines the level of a society as whole and each person individually. State Concern for the quality of products is considered to be obligatory for the national economy. Last years are characterized by a significant increase of attention to the problems of food safety and reinforcing the control over their quality from both sides: the individual state control and the international level. Ukraine has chosen the European way of development in the main direction of the state policy, and accoding to this the path of modernizing the economy, involving foreign investments, access to world markets, participating in various European programs and agencies. According to this strategic direction Ukraine is facing important tasks in the field of food safety, the resolution of which will allow to sustain international cooperation with the EU. Based on the study it has been found that difference in technical norms and standards is one of the major problems faced by Ukrainian and European companies. In-deep and Comprehensive Free Trade Area (DCFTA) provides the approval from Ukrainian and European standards for industrial and agricultural products, which means production and sale by the same rules. Ukraine needs to make orders to progressively achieve compliance with EU technical regulations and systems of standardization, metrology, accreditation, conformity assessment and market surveillance and to follow the EU principles and practices which are set out in existing EU Regulations and Decisions. Ukraine should align its legislation on sanitary and phytosanitary activities and keep animals according to norms and standards of the EU. 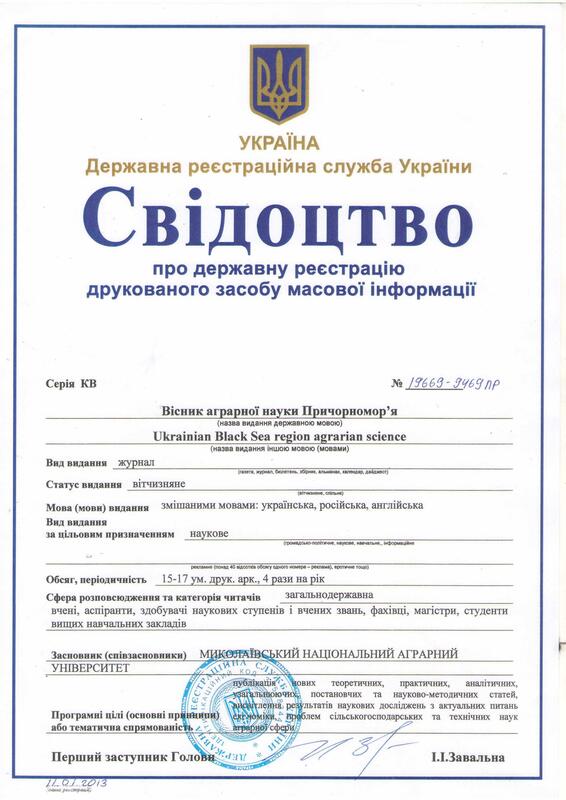 The Law of Ukraine “Basic principles and requirements for safety and quality of food» № 1602-VII has the nature of European integration and involves participation in the relevant international organizations that set standards for sanitary activities and food at the regional and global levels. Key words: Ukraine, international cooperation, production, safety, quality. Preservation of egg-laying quails during 5 months of productive period by the use of the drug “Argenvit” in various concentrations has been estimated. It has been found that the use of drug nanosilver in the concentration 0,02% and 0,03% gives the best results, increasing the preservation of the flock by 6,7%. Key words: egg-laying quails, preservation, nanosilver, the drug “Argenvit”. Assessment of preservation of quail egg-laying flock during exploiting by the use of nanosilver. 1. 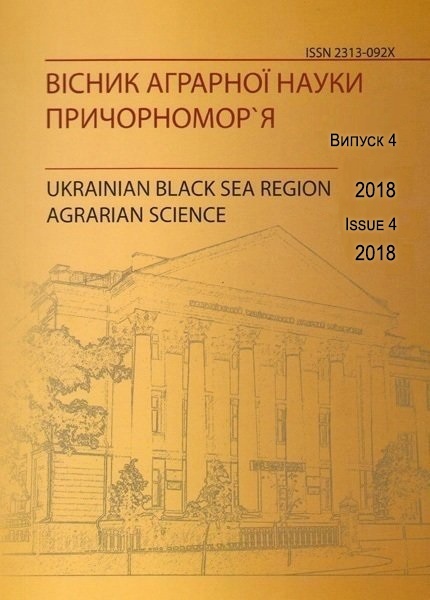 Borisevich V. Complex exogenous and endogenous disinfectant “Sumer silver” in growing broilers / V. Borisevich, V. Kaplunenko, M. Kosinov // Proceedings of XII Eng. Conference poultry with international participation “Actual problems of modern poultry farming”. – Kharkiv, 2011. – P. 45-50. 2. Busol V. Influence of nanocomprising complex Ag-Cu on physiological parameters and performance quail [electronic resource] / V. Busol, M. Sytnik – Access: http://elibrary. nubip. edu. ua/15990/1/12bvo. pdf. 3. Bernavsky Z. Colloidal silver is a natural substitute of antibiotics / Z. Bernavsky. – Moscow : Korall Club,2006. – 21 p.
4. Groza V. Testing of disinfectant “Argenvit” in the poultry enterprise / V. Groza // Poultry: science coll. / Kharkiv: IT NAAS,2013. – Vol. 69. – P. 80-84. 5. Pat. 95309 Ukraine, IPC A 23 K 1/22 (2006. 01). Method of improving the preservation of quail / L. Patryeva, V. Groza; patent owner is Mykolayiv National Agrarian University. – № u201404276; appl. 04/22/2014; publ. 25. 12. 2014, Bull. № 24,2014. 6. Shatova D. The use of colloidal silver to enhance the safety of poultry [Electronic resource] / D. Shatova, E. Zynyna // V International students’ electronic scientific conference “Students’ Scientific Forum 2014”. – Access mode. – Access: http://www. scienceforum. ru/2014/660/3744. 7. Shuliak S. The ability of colloidal silver to cumulation by organs and tissues for the full cycle of growing quail / S. Shuliak, D. Zasyekin // Veterinary Medicine of Ukraine. – 2013. – № 04 (204). – P. 35-37. Milk and dairy products are one of the main of foods that are rich in protein, essential amino acids, trace elements, vitamins and other nutrients. The problem of quality milk and dairy products, despite strong demand, is one of the major and painful problems of the industry, which should be given special attention. It relates mainly to non-compliant technological disciplines in the production, under the control of products for safety, in case of compulsory work for state certification (poor labeling, production in violation of recipes, not of the produce for physico-chemical parameters ). Today, Ukraine has an issue with cow’s milk as a raw material. This is because the predominant share of dairy products in the current market comes from farms that use only hand milking. Hence, the potential and the real possibility of bacterial contamination of milk. In addition, the added problems on the stages of transportation of products, which requires proper packaging, specially equipped vehicles and more. Based on the previous position, the quality of milk as raw material must meet safety standards. The aim of research was to establish whether samples of raw cow’s milk obtained in an agricultural enterprise present the number of chemical-toxicological indicators of the safety of these products. This study showed the actual concentrations of pesticides and heavy metals in raw milk. Thus, the fate of massive DDT and HCH actual concentration of the latter was below the MCL, or less than 0. 05. In the investigated samples of milk bazudynu, karbofosom, metaphos, trichlorfon were found. Regarding heavy metals, among the submitted samples of milk exceeded MPC by mass fate of lead, arsenic, cadmium, mercury, copper and zinc were found. Further studies should explore the safety and quality of dairy products in agricultural enterprises depending on the factors of organizational and technological nature. Analysis of safety indicators of milk in the agricultural enterprise. The analysis of the hatching eggs of ducks qualities of cross type «Temp» in the beginning of a productive period was made. It has been established the preparation of eggs of ducks on the basis of their pre-incubation calibration weight classes with gradation of 10 g makes it possible to improve the results of incubation of eggs weight 81-90 g and 91-100 g. The lowest weight class eggs (70-80 g) had lower rates of hatching qualities in comparison with all the calibration classes and had no signifi cant difference with the group of eggs, which have not been calibrated. L. Patreva. Infl uence of grading eggs of ducks of cross type «Temp» on their hatching eggquality. 1. Breslavets V. A Kachestvo ynkubatsyonnыkh yayts v zavysymosty ot ykh massы y prodolzhytelnosty produktyvnoho peryoda utok [Tekst] / V. A. Breslavets, V. A. Lukianov, L. H. Prokudyna, D. A. Pustovyt // Ptytsevodstvo. — 1984. — Vыp. 37. — S. 45. 2. Diebrov V. V. Otsinka vidtvornykh i produktyvnykh yakostei husei [Tekst] / V. V. Diebrov, L. P. Vohnivenko // Tvarynnytstvo Ukrainy. — 1997. — # 5. — S. 22—23. 3. Inkubatsiia yaiets silskohospodarskoi ptytsi / [Breslavets V. O., Sakhatskyi M. I., Stehnii B. T., Bezrukava I. Yu. ta in.] ; pid red. V. O. Breslavtsia. — Kharkiv, 2001. — 92 s.
4. Otrыhanev H. K. Tekhnolohyiaynkubatsyy / H. K. Otrыhanev, A. F. Otrыhaneva. — M. : Rosahropromyzdat, 1989. — 190 s.
5. Orlov M. V. Byolohycheskyi kontrol v ynkubatsyy / M. V. Orlov. — M. : Rosselkhozyzdat, 1987. — 123 s. : yl. Науковий керівник – д-р с.-г. наук, професор Патрєва Л.С. Представлено результати вирощування перепелів породи фараон з використанням препарату “Аргенвіт”. Встановлено, що 0,02% розчин наносрібла позитивно впливає на живу масу перепелів наприкінці вирощування. Отримано дані щодо регуляції статевого співвідношення потомства у качок. Встановлено вірогідні результати щодо співвідношення самців і самок, виведених із яєць, каліброваних за масою та індексом форми. Одержання більшої кількості самок можливо на основі інкубації яєць із класу М0 за масою яєць.